Not only do rainbows remind me of Noah but monkeys do too! He had a monkey nursery complete with monkey bedding from pottery barn, monkey stuffed animals and an adorable monkey painting. His favorite monkey (that we buried him with) was his orange pottery barn monkey that I bought because it matched the bedding (I had to have the COMPLETE set). Several days after Noah died my friends convinced me to go for a walk around the pond by my parents house (we stayed there for a couple weeks until we were ready to go home). 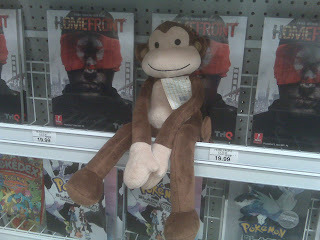 As we walked, I saw this random monkey stuffed animal puppet sitting on a bench. I should have taken it (or at least taken a picture) but I wasn't thinking clearly at that time (and it probably belonged to a child that would come back for it!) but at that moment I knew it was Noah sending me a sign that he was ok and that he was thinking of me. 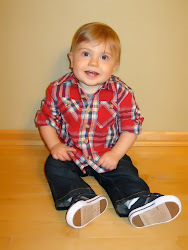 The other day I went to Babies R Us to buy a present for someone (my LEAST favorite place right now). It was hard - it was a Saturday afternoon (wrong time to go there) and packed with little kids. It brought back so many memories. I actually saw a girl crying to her husband while I was there. He was hugging her and comforting her. I immediately wondered if her child died too. It's awful how my mind immediately jumps to that. Anyways, as I was checking out I looked over and saw this monkey stuffed animal sitting on a random shelf with a bunch of video games. It was just staring at me. I had to laugh. 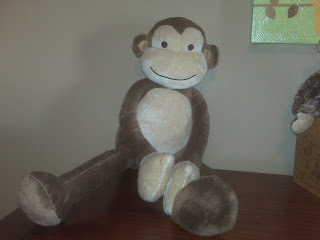 It was not just any monkey stuffed animal but the exact same one that we have in Noah's room. I knew it was Noah telling me he was there with me and it immediately made me smile. Thank you Noah for the signs that you're with us! Please keep sending them! It's the only way I get through each day and know you are with us. This just touched me so much...I sleep with Taylor's monkey every night. In the days after we lost her, I carried it every where with me.